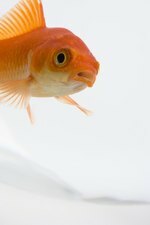 Eyesight is a highly developed sense in goldfish. In fact, they have vision superior to that of a human in some respects. We humans are air based creatures and evolution has graced us with seeing long distances with excellent resolution of up to a mile. The goldfish sees clearly only for about 15 feet. This is why a sudden move from afar might startle them while the same close gesture keeps them relatively calm. But what about goldfish and them seeing in the dark? Let us first examine the vision of fish in general. As you can imagine, vision is an important sensory system for any species. The eyes of a fish are similar to that of any terrestrial vertebrate like a bird or a mammal, except that their eye lenses are more spherical. We humans can see three colors in RGB (red, green and blue). We can also tell the difference between light from dark. Our finned friends see those colors also, as well as ultraviolet light which makes them sensitive to polarized light. For example, the lamprey has well developed eyes while the hagfish has simple primitive eyespots. The ancestors of the hagfish were apparently pushed very deep into the ocean's dark waters. In those waters they became less vulnerable to sighted predators. The hagfish developed a 'convex eyespot' able to gather more light than a concave eyespot. Fish adjust focus my moving their lens either near or far from retina (unlike humans) and deep sea fish have eyes best suited to their dark environment. Four visual pigments mediate fish vision. These pigments absorb various light wavelengths. Some vertebrates absorb UV light in order to see objects reflecting UV light. This visual trait has been maintained and developed through evolution in a wide variety of fish, and is most likely related to mate selection, communication and foraging. There are many fish species that can see well beyond the ultraviolet end of the spectrum and even beyond the violet. However, ultraviolet light may only be used during a portion of the fish's life and, as they become older and move into deeper waters, there may be little or no ultraviolet light at all. Are fish sensitive to polarized light? Fish, including goldfish, are sensitive to polarized light, which is most abundant in the morning or at dusk. This light, when reflected off the scales of a fish could aid other fish to detect it against a diffuse background and may impart useful information to fish schooling about their proximities and their orientation relative to neighboring fish. This capability also allows fish to detect predators or prey through waters surfaces and thus avoid troublesome reflections. Have you ever wondered why your fish gather near and recognize you at feeding time even on a sunny day, the reason is polarization! Goldfish have a highly developed sense of smell and they use that sense to get around a dark fish tank but no, they cannot see in the dark. Their 'lateral line system' allows them to 'feel' tiny pressure changes in the water when they're swimming around objects (this is the same manner in which blind cave tetras maneuver). 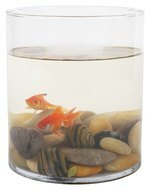 Goldfish owners or any fish owner are making a mistake by keeping an aquarium light on through the night. Fish do require darkness in order to sleep and leaving the light on constantly for them is bad and may even cause stress in your fish's peaceful life. Your fish's light and dark receptors work like ours. As light diminishes color resolution decreases and luminance becomes the dominant part of vision. For this reason they are most at risk at night by predators. Outdoor pond fish have much healthier eyes than aquarium fish where artificial light is turned on and off frequently. Keeping your fish in a fishbowl is not a good idea. The bowl is much too small, has dissolved levels of oxygen and no bio-filtering. Fish need tanks with heavy filtration. When provided with the proper aquarium, your fish will live many years instead of only a few months!